You want to have your bachelor party in Vegas, ey? Can’t say we blame you; but what’s that? not sure where you should take the party to? In theory, it’s easy to organize your party. Pick a place to party and a place to crash and you’re done; but it’s a little more challenging when you want to add convenience into the picture. You don’t want to travel all over the Strip and waste any time on the road, so you’re looking for a hotel that is Bachelor Party friendly – meaning it has everything you need under one roof. Luckily for you, that’s not a rarity out here in Vegas. Outside of the possibility that the Cosmopolitan was built with bachelors in mind, the Cosmo offers several layers of convenience and added bonuses. First off, for your party, you can reserve a VIP table at Marquee. It’s arguably the hottest nightclub in terms of bachelor parties, so you’re going to fit right in. Marquee is high end to the max and is chock full of entertainment and celebrity sightings. At the end of your extravaganza, you and your party can retire to one of the Cosmo’s high end accommodations. The Bungalow or West End Penthouse are massive spaces upwards of 3,700 square-feet. 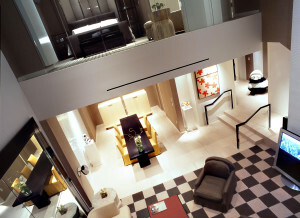 They offer multiple rooms, living space, and entertainment space for the party that goes beyond the nightclub’s hours. That’s not all, though, because if you wake up the next morning with the itch to party, there’s Marquee Dayclub. Soak in a large, crystal clear pool and party in an atmosphere that’s none-to-different from Marquee’s nightlife iteration. Typically, the Wynn Resort get’s all of the love, but when it comes to being bachelor party friendly, Encore sneaks by, and it does so with one thing – Encore Beach Club. Before we jump ahead to the day-after party, Encore also sports Surrender, a high end nightclub that features a 90-ft snake over the bar. The party can split between Surrender’s opulent in-door space or filter out onto the outdoor pool deck, which features rentable cabanas and bungalows. The next day, you can bring the party to the Encore Beach Club, which is arguably Vegas’ top dayclub. Here, you will definitely want to rent a bungalow for the premium experience. When your party needs a break, they can retire to the 2 bedroom apartment or 3 bedroom duplex located in the Encore Resort. These extravagant living quarters are fit for a king- or a group of bachelors for that matter. The MGM is easily one of the best resorts in Vegas. It’s sheer size allows for plenty of entertainment, large casino floors, and it sports one of the nicer resort pools; but for bachelors, the experience is so much better. MGM also has one of the largest nightclubs in town, one that sports a lounge and a restaurant. Hakkasan is a Chinese-themed nightclub, split up into 5 levels of sheer entertainment. On the first level is the restaurant, which serves up 5-star authentic Chinese cuisine. Level two houses Ling Ling’s, a soft-toned lounge that paves the experience for the next three floors, which house Hakkasan’s main entertainment. After partying on all of Hakkasan’s floors, you will need to retire to your City View, Penthouse, Skyline, or Skyline Terrace suites. When you’re refreshed, you can grab a bite to eat at the massive food cort and make your way out to WET Repubic, the on-site adults only pool. Here, you can either catch some sun in a comfortable lounge chair or join in on the party in one of two large pools. This one is new to the Las Vegas scene, but it quickly showed that it can stand up against Vegas’ elite. 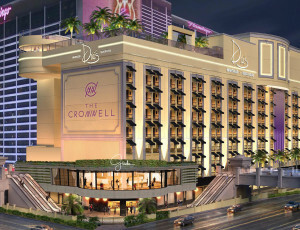 The Cromwell is located right at the heart of the Strip, only a few blocks away from the newly built entertainment square – Linq. It’s what’s inside The Cromwell that makes this Number 2 on this list, for located in this little boutique is a name that Vegas frequenters will recognize – Drai’s. At one point, Drai’s was all about the after party, but here in The Cromwell, Drai’s is a night and day life connoisseur. Offering an exciting nightclub and an equally as entertaining dayclub, Drai’s show’s that that it can party with the best of them. For a little r & r, The Cromwell houses several suites, like the Gallery and Cromwell, that will round off your bachelor experience. The large accommodations offer top of the line furnishings and unbeatable views. You may be surprised to hear that the top bachelor friendly hotel is actually not even located on The Strip. Sure, there’s plenty to be had along Las Vegas Blvd, but when we tell you that The Palms could host your party for several nights in a row, we aren’t exaggerating. Before we even get into the nightlife, the Palms is home to many amenities, like the Palms Signature line of suites, the Ivory and Fantasy tower rooms, and the Luxe collection of penthouse and themed suites. When you’re set up in your room, you will want to go exploring to decide which nightclub you want to party at. That’s right, there’s multiple. Ghostbar, Rain, and Moon are top of the line, with Ghostbar and Rain offering views of the Las Vegas Strip. Ghostbar even offers up a glass balcony floor so you can look down upon the Palms Pools and scope out where you will be partying the next day. The best part about the Palms is that it’s completely affordable, offering pricing that completely undermines hotels on the Strip. Now that you have a clear indication of where you should party, it’s time to make the ultimate decision. This is a once in a life time situation – for most people – so decide carefully. In truth, you can’t make a mistake in your choice. Just be sure, when you do start booking your party, keep Bachelor Vegas in mind. With our help, you can be partying VIP-style in your night and day club of choice. 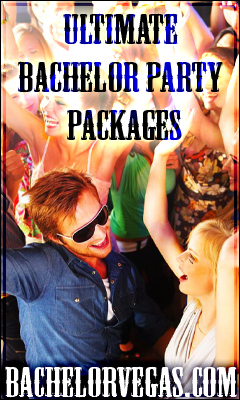 Follow this link to reserve your bachelor party with Bachelor Vegas. This entry was posted in Events, Las Vegas, Nightclub, Nightlife, Pool Party. Bookmark the permalink.